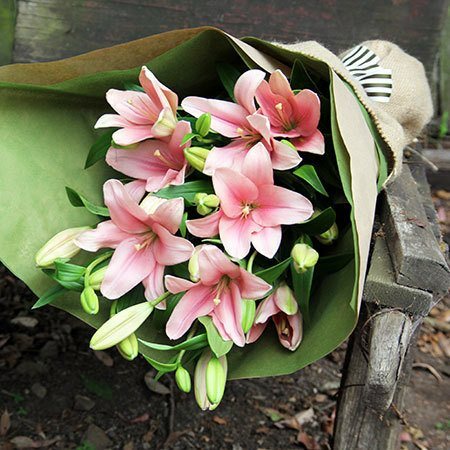 A bright gift wrapped bouquet of super popular lilies ideal for any occasion. Available in a variety of colours, the Asiatic Lily (sometimes referred to as Tiger or LA lilies) is a long lasting flower that provides excellent value for money. Not to be confused with the exotically perfumed white, lemon & pink blooms of the oriental lily, Asiatic lilies are scent-free and range from lemony yellow to buttercup gold, bright orange to burnt orange, plum red to burgundy, pale pink to blush rosy pink. Their bright coloured petals and long graceful stems put on a dazzling tropical display! 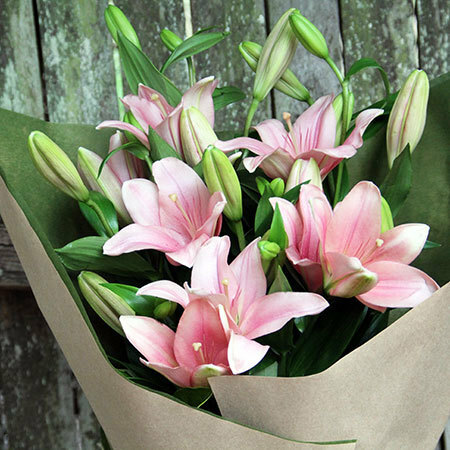 Send a bouquet of lilies to celebrate a birthday, congratulate, thank, and cheer. Order flowers online, call toll free on 1800 66 66 46 or email us directly to sales@flowersforeveryone.com.au . The pictured bouquet will be delivered with as many fresh stems of closed buds as possible for longevity. The image displayed on our website is indicative of the bouquet as the flowers begin to open. If you would prefer more open flowers for a presentation bouquet or initial impact, please note this under the `Special Delivery Instructions` box when ordering. If we currently do not have blooms already fully open (particularly during the cooler months), the team will get in touch directly to offer alternative options. 2019-02-23 Service rating : Ease of use and following through with what you say you will provide. Product : Were as stated - some open, some in bud. Flowers lasted for a longer time due to this. Product : Sent flowers to my mum for Christmas from America to Australia. Arrived perfectly on time and in tact. Highly recommend!! 2018-11-23 Service rating : Our landlords were over the moon with the level of service during the delivery & stated that the flowers were beautiful & fresh. We will be using this service again. Product : Our landlords were over the moon with the level of service during the delivery & stated that the flowers were beautiful & fresh. We will be using this service again. 2017-02-07 Excellent service received ! 2017-02-03 Service rating : service good however website is not userfriendly. No option to quickly add something else while in check out. 2016-12-06 Very efficient and value for money! My daughter liovedv the flowers that were chosen! ! Very happy with the purchase! 2016-11-11 It was gift given to my niece to good luck for her exams. I never seen the flowers yet but have seen in the website. Would recommended to anyone to use this website. 2016-10-23 Extremely fast and efficient delivery of flowers, at a reasonable price! Perfect for a gift, would recommend. 2016-10-17 No faults I can identify. 2016-10-13 Service rating : I have been looking for a great online store and I was extremely impressed with the flowers and the service. Excellent flowers and even better service!! Product : Beautiful flowers!! Presentation and longevity of the flowers was perfect! 2016-10-04 Good options for flowers and gifts. Product : Great thanks! Great flowers, easy to order, fast delivery. 2016-09-22 Everything I asked for was supplied effortlessly, on time and by all accounts fresh and presented nicely. 2016-09-22 Brilliant, will definitely use the service again. 2016-09-22 Service rating : I COULD NOT FAULT THE SERVICE, IT WAS EVERYTHING I COULD HAVE HOPED FOR. Product : FABULOUS ARRANGEMENT AT A VERY GOOD PRICE...DELIVERY AS PROMISED ! 2016-09-12 Wonderful! Arrived on the same day, presented beautifully, amazing quality and delivered to a difficult address which was much appreciated. Have used before and will use again! 2016-09-12 Really helpful customer service team, flowers were delivered on time, great speedy service! Will absolutely use again - thank you so much Flowers for Everyone! 2016-09-09 Service rating : I have used Flowers for Everyone on three occasions. On the first and third occasions I have had excellent service and I have been thrilled with results. On the second occasion the flowers were delivered before the recipient was home. I spoke to some one at your company who said it was because I put after 2pm. However, they were delivered around midday. It was disappointing that the addressee did not get the surprise of opening the door to a beautiful flower arrangement. The flowers were beautiful and she loved them. I was disappointed because I wanted her to get a surprise. Overall, I am happy with the service and I recommend you to anyone I know who is looking to send flowers to anyone for whatever reason. Product : I didn`t get to see it. But I was told it was beautiful! 2016-09-06 Recipient was very pleased with her flowers. They were vibrant, fresh and arrived before lunchtime. I would use flowers for everyone again. 2016-09-03 Service rating : The flowers were not at all as presented in the pictures on the website. I live far away, in Brazil, and bought the flowers online as a gift to a very special friend who lives in Australia. The photos on the website were beautiful, and I was deeply disappointed when she sent me the photos of the actual flowers, which were closed and not beautiful at all. I spent a lot of money on the flowers and did not receive the product as expected according to the photos. I uploaded the photos on the website and the actual ones received. Product : The flowers were not at all as presented in the pictures on the website. I live far away, in Brazil, and bought the flowers online as a gift to a very special friend who lives in Australia. The photos on the website were beautiful, and I was deeply disappointed when she sent me the photos of the actual flowers, which were closed and not beautiful at all. I spent a lot of money on the flowers and did not receive the product as expected according to the photos. I uploaded the photos on the website and the actual ones received. 2016-09-01 My mum absolutely loved these! Wish I could have seen her face. Thank you thank you for the amazing service. 2016-09-01 Great service. Fast delivery. Thank you. 2016-08-25 Service rating : The candle did not get delivered with the flowers. Product : Candle would have been nice. Product : They are beautiful. Have ordered these many times. 2016-06-15 Service rating : excellent service and super quick! Product : The tiger lillies were absolutely gorgeous! So fresh talk about value for money would definitely use flowers for everyone again! Product : Just like the picture showed, perfect! 2016-06-01 I would have loved an email confirmation of my order but otherwise everything was good! Product : The lily`s were beautiful but a couple looked a little on the old side making the bunch not look as fresh as anticipated. 2016-05-06 Service rating : Flowers were delivered on time, I was notified and they looked fresh and gorgeous. Product : Tiger Lily is beautiful bunch of flowers. Product : Kate sent a picture they look fab. 2016-04-11 Service rating : Easy to order, no fuss and efficient. Delivered when they said they would. 2016-03-30 Service rating : internet site was misleading put in the date required and it changes to suit your next available time without stopping you from continuing, found out to my surprise I had ordered flowers 5 days late than required,,, very unprofessional. 2016-03-22 Service rating : Quick delivery, beautiful flowers. Thanks for making my mums birthday an even more special event. Product : Beautiful flowers. Would buy again. 2015-12-16 It would have been nicer if my recipient received her flowers on the following day after the purchase. I do understand about the mix up of name, but florist wasn`t too far from the hotel, for a drop off that same day which was the day after the purchase. Recipient needed to wait 2 days after the purchase. 2015-12-10 Great service! The flowers were well loved! 2015-12-07 Service rating : I have ordered from you before and I can always rely on you . Product : My Granddaughter loved her flowers. She sent me an email including picture and I must say they were fantastic. My son gave them to her after she had finished her ballet concert. Well Done Flowers For Everyone. 2015-12-06 Service rating : delivered promptly and on schedule. Product : My Mother loved them and some had buds not yet bloomed, so they lasted really well as the new buds blossomed over time. Product : Flowers were lovely! 2015-11-19 Absolutely wonderful. I am currently away for work and sent them to my sister who was thrilled to open the door and be given the flowers. Thank you for delievering them when you did. It was much appreciated. 2015-11-03 Service rating : Service and delivery of flowers very good. Product : Flowers were beautiful and long lasting. 2015-11-03 Service rating : Great website, fantastic selection and beautiful flowers that are easy to order. Product : Well presented, very well received and still going strong a week later! 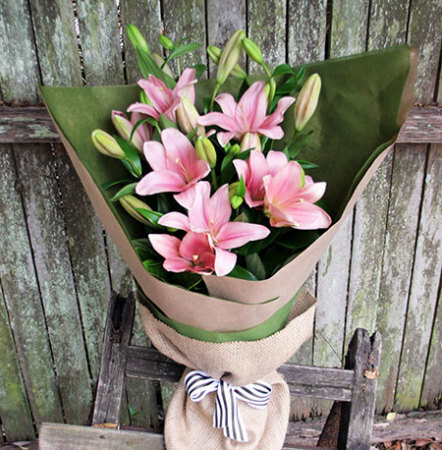 2015-10-22 I received an immediate e-mail from daughter in Melbourne to say a `wonderful bouquet of lilies` had arrived and made her day! 2015-07-23 Service rating : Fast service, great price. Definitely recommend you guys again. Product : The bunch is still blooming, perfect! 2015-07-09 Service rating : Nice prompt service, easy to use website. 2015-07-07 Service rating : My friend said the flowers were an absolute dream, thank you so much. Product : I always use Serenata as they have the best customer service! 2015-06-01 Service rating : Service is always fast. I have bought a number of flowers here over the past few years and have always had very positive feedback from the recipients. Product : Although I didn`t see the flowers, the recipient was delighted with them. Product : She loved them! 2015-05-20 Service rating : Really efficient service! Product : I was truly amazed at the speed of delivery! 2015-04-30 Service rating : great customer service and very helpful. Product : exactly what i expected. receiver loved them. 2015-04-30 Service rating : Excellent service. Same day delivery. Product : Friend was very happy with these flowers! 2015-04-21 Service rating : Great last minute delivery! 2015-04-19 Service rating : Very dissapointed that the flowers were deliverd to my friend at her work place at 4pm, luckily she was still at work. The flowers were ordered and paid for days in advance so I would have thought an earlier delivery time was appropriate. Product : The entire boquet was closed, whilst I appreciate the flowers will open over time, it wasn`t what I expected my friend to receive on her birthday. Product : I requested creme lillies to be delivered & pink lillies were what the recipient received. 2015-04-13 Service rating : I have used Flowers For Everyone for a few years now and find their service easy to use, quick and efficient. Would recommend to others definitely. Product : From all the people I have sent flowers, all have commented how lovely the arrangements have been and many have lasted quite some time. 2015-03-31 Easy to use, quick service and great customer service! 2015-03-27 Service rating : Flowers arrived on time and were immaculately presented. Very happy all round. Product : The flowers received were gorgeous, exactly as pictured. 2015-03-26 An efficient service and delivered the lively flowers when they said they would. A happy customer, will definitely use Flowers for Everyone again. 2015-03-18 My friend said they were lovely and they were a great surprise - to her I guess. Product : Loved them...will use again !